You are cordially invited to visit one of the last of the Mark Twain Era steam towboats used so successfully on the Mississippi and Ohio River systems during the past century. This boat was presented to the Ohio Historical Society in September 1955 by the Crucible Steel Company of America and is administered as a section of the RIVER MUSEUM of CAMPUS MARTIUS MUSEUM. Acquisition of this fine specimen was sponsored by the Sons and Daughters of Pioneer Rivermen. 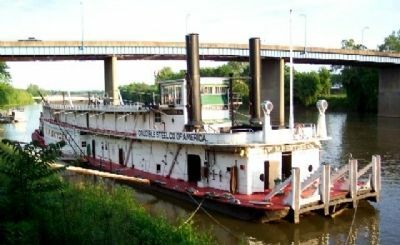 The W. P. Snyder, Jr., is one of the last of the proud fleet of steamboats which brought prosperity, development and a rich tradition to the Great Ohio River Valley. Erected 1959 by S. Durward Hoag, Innkeeper. Location. 39° 25.265′ N, 81° 27.773′ W. Marker is in Marietta, Ohio, in Washington County. Marker is at the intersection of Front Street and St. Clair Street, on the right when traveling south on Front Street. Touch for map. 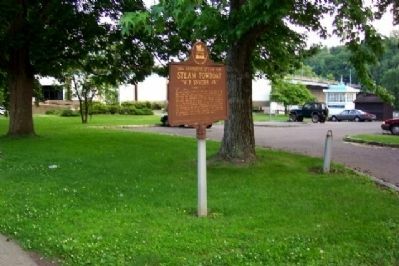 Marker is at the entrance to the parking lot of the Ohio River Museum. Marker is in this post office area: Marietta OH 45750, United States of America. Touch for directions. Ohio River Museum, with Tell City pilothouse, in background. (within shouting distance of this marker); Pioneer Families of the Ohio Company (within shouting distance of this marker); Oldest Pilothouse (within shouting distance of this marker); Mighty River / Learning the River (within shouting distance of this marker); River Town / Sails and Steam / The Highway West (within shouting distance of this marker); Flatboats (within shouting distance of this marker); Flood Heights (within shouting distance of this marker); The Towboat W. P. Snyder Jr. (within shouting distance of this marker). Touch for a list and map of all markers in Marietta. 3. Towboat W. P. Snyder, Jr.
More. 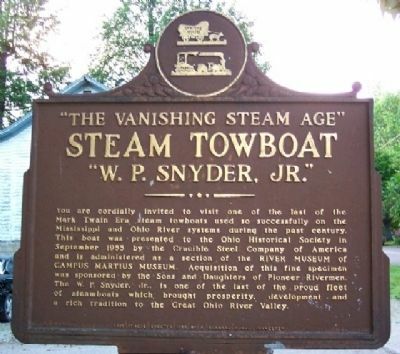 Search the internet for Steam Towboat "W. P. Snyder, Jr.". Credits. This page was last revised on June 16, 2016. This page originally submitted on July 8, 2009, by William Fischer, Jr. of Scranton, Pennsylvania. This page has been viewed 732 times since then and 3 times this year. Photos: 1, 2, 3. submitted on July 8, 2009, by William Fischer, Jr. of Scranton, Pennsylvania. • Craig Swain was the editor who published this page.